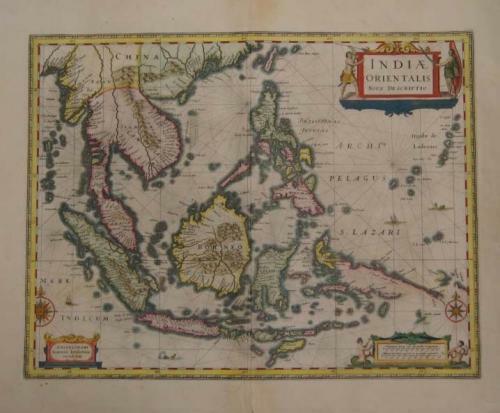 Title: 'Indiae Orientalis Nova Descriptio' from "Atlas Novus, sive theatrum orbus terrarum." Amsterdam, 1639 A.D. French text to verso. The map shows area of south east Asia with their countries of Indonesia with Borneo, Philippines, Thailand and a south part of China. The map is decorated with a beautiful title cartouche and very nice maritime illustrations. In very good condition, minor toning, small margin paper repairs.